DAVID WORDSWORTH Away from being Addison’s Musical Director, David’s professional life is increasingly diverse. 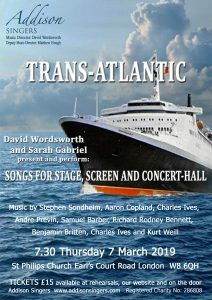 Next year he is working on a project with Sarah Gabriel and luckily for us he has persuaded her to join him in this cabaret-style musical evening. TUBE: The church is a 5/10 minute walk from Earl’s Court Tube station. Use Earls Court Road exit and turn left. Cross over Cromwell Road and St Philip’s is on the right hand side of the road. BUS: C1 and 328 both stop nearby (either Scarsdale Villas or Pembroke Road stop, depending on direction of travel).